“What an amazing trip with an amazing company, Kokopelli Rafting! Everyone we talked to including people answering the phones, working in the office and the guides were all great… The guide was amazing with my kids ensuring everyone (especially me!) was comfortable and that they were safe and happy! He made sure they were secure and provided a history lesson, taught them about rafting and even let them help guide. Everyone had an amazing time!” Great job Kokopelli! 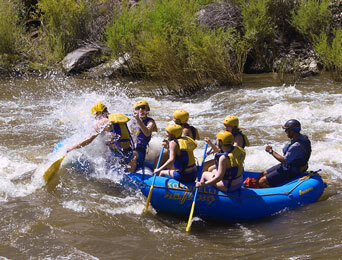 “This was our first time rafting and needed something calmer for our 11 year old daughter. Found Kokopelli Rafting online. The comments on the guides convinced me to book. We were not disappointed. They picked us up 10 minutes early. They were able to rearrange plans for another family with no hassles. Then we were on our way. Wren was our guide. He went over the safety guidelines. Made sure we knew what to do and was very patient with getting us started. He was extremely personable and very knowledgeable about rafting and the river. We couldn’t of asked for a better guide. Thank you Wren for a fantastic experience and for the swim in the Rio Grande. Opportunity of a lifetime”. We offer small custom trips for groups of 2 to 30, personalized service, an impeccable safety record, great food, and exceptional, professional interpretive guides! Our half-day rafting trips are full of whitewater fun, rich history, geological wonders and entertaining folklore! Learn how each rapid got its name, mysterious conspiracy theories around ill-fated gold prospectors and tall tales that only a seasoned Rio Grande river guide would know. There are a few “classic” whitewater rafting runs in the Western United States; two are right here in Northern New Mexico within a short drive from Santa Fe! The infamous Taos Box and captivating Rio Chama. 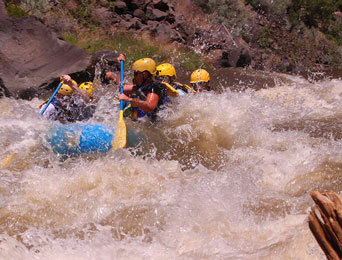 Join us for an unforgettable rafting experience and see for yourself why these are classic whitewater rafting trips! 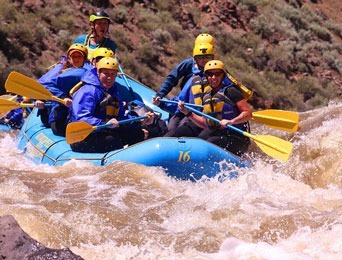 Kokopelli Rafting Adventures has the longest continuous series of commercial outfitter permits of any rafting outfitter in New Mexico, starting in Southern Colorado and continuing through to Cochiti Reservoir. Linking these sections makes for great multi-day rafting trips! 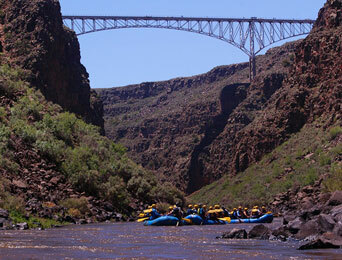 Let us help you plan the perfect two- or three-day getaway on the Rio Grande or Rio Chama! 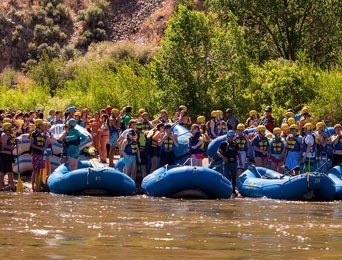 Kokopelli Rafting Adventures core values of safety, service and professionalism align well with safety-conscious corporate managers and event planners, youth groups, family reunions and regional conventions. We regularly book custom unforgettable rafting experiences for groups of 50 to 120 without sacrificing quality for quantity. Which trip is right for you? Let us help you decide based on length of trips, classification of rapids, minimum ages and more. 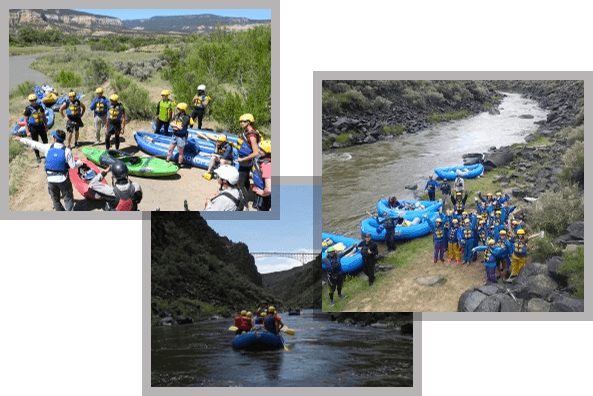 Kokopelli Rafting Adventure’s guide training significantly exceeds industry standards with our 80 hour training program emphasizing safety, service and professionalism. Learn the hands-on skills of river guiding and the softer skills of service and professional that make Kokopelli guides requested year after year. THE KOKOPELLI CREW CARES ABOUT OUR CUSTOMERS, OUR RIVERS AND THE ENVIRONMENT! 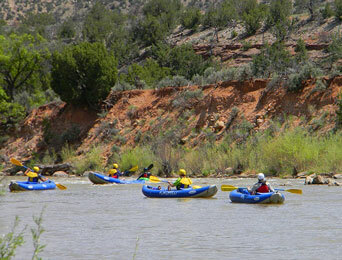 Raft and kayak the Rio Grande and Rio Chama rivers in New Mexico, experiencing thrills from Class IV whitewater rapids to serene Class I canyon floats. Kokopelli’s Exceptional guides will insure it is an experience to remember. We offer small custom trips, great food, personalized service, and exceptional guides. Contact Us for more information about Private Group Adventures!